For a lot of Marvel fans, the Venom promotional spots have been lacking in the symbiote department and even more fans are realizing how weird Tom Hardy's voice is. All of the unpopular pieces of the Venom trailers and teasers have now been compiled into one giant Weird Trailer, and it's awesome. Ace Ventura, Tobey Maguire, Joe Pesci, Drax the Destroyer, and many more characters take the Spider-Man universe and twist it up into a mind boggling experience. If you didn't like any of the previous Venom trailers, this one might be the one for you. Tom Hardy and Riz Ahmed share some awkward silence in the new Venom weird trailer, and while it's not as over the top and silly as the rest of the video, it seems to work. At least it does until Ahmed reaches up to boop Hardy on the nose with his finger. Elsewhere, Hardy's Eddie Brock starts to hum the Indiana Jones theme song and then gets an attacker to harmonize with him in a bit that goes on way longer than it should. This is by far the most bizarre of all of the Weird Trailers that have been released so far. In addition to the Venom Weird Trailer, the creator has also taken to making Infinity War, Rogue One, and a few others. The trailers are all edited to include pop culture references as well as other tidbits that correspond, or don't, with the original film. Ace Ventura opening a closing the sliding glass door seems to fit in perfectly while the symbiote is unveiled, but where did he come from?. It's worth noting that the roughly 3-minute Venom trailer is by far the most crazy one that has been released by the YouTube channel, which is saying something. For all of the MCU fans wishing to see Venom in a future project, Eddie Brock and Drax the Destroyer have some interesting discussions in the Weird Trailer and Ebony Maw from Infinity War even makes an appearance while wearing a blonde wig. While Venom won't be appearing in the MCU any time soon, it's good to know that he and Drax already have a good relationship, even when Drax is attempting to be invisible. This weird trailer is something that had to come out of the mind of a madman. The real Venom movie will hit theaters on October 5th and it will be one hell of a ride, but it cannot compare with the latest weird trailer. While some fans seem to be worried about the footage that has been released so far, the latest real Venom trailer has gone on to calm some of those skeptical fans down. Additionally, Sony is taking the Spider-Man spin-off movies very seriously, which means that we will more than likely see a sequel as well as many more of the spin-off movies. 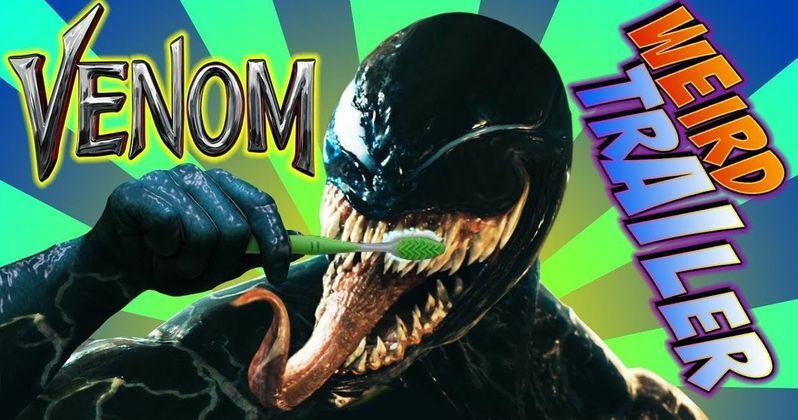 While we wait to see Venom on the big screen, you can check out the Weird Trailer below, thanks to the Aldo Jones YouTube channel. As a warning, there are a few NSFW moments.